Find everything you need to install car audio components, here at HalfPriceCarAudio.com. We have T-Spec Wires & Cables. 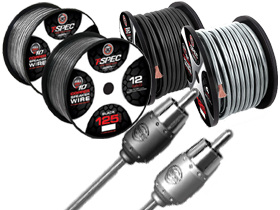 T-Spec has once again chosen to take the high road with a full line of ABOVE SPEC cables that exceed CEA and ANSI specifications for gauge size. You can choose from variety of gauges such as 4 Gauge, 8 Gauge and more. provide current capability for your stereos sensitive electronics. For more on T-spec products just browse HalfPriceCarAudio.com.